1. All cells have a membrane potential; however, only certain kinds of cells, including neurons and muscle cells, have the ability to generate changes in their membrane potentials. Collectively these cells are called excitable cells. 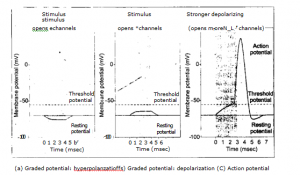 The membrane potential of an excitable cell in a resting (unexcited) state is called the resting potential, and a change in the resting potential may result in an active electrical impulse. ahoy the cell to change its membrane potential in response to stimuli the cell receives. If the stimulus opens a potassium channel, an increase in efflux of potassium will occur, and the membrane potential will become more negative. Such an increase in the electrical gradient across the membrane is called a hyperpolarization. If the channel opened by the stimulus is a sodium channel, an increased influx of sodium will occur, and the membrane potential will become .less negative. Such a reduction in the electrical gradient is called a depolarization. 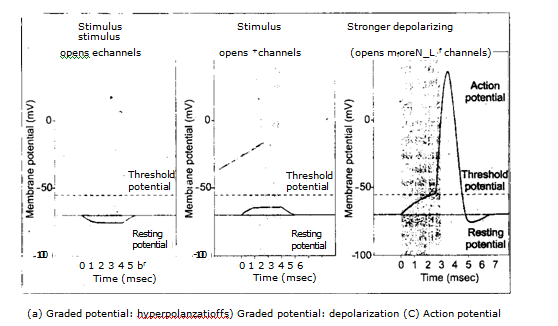 Voltage changes produced by stimulation of this type are called graded potentials because the magnitude of change (either hyperpolarization or depolarization) depends on the strength of the stimulus: A larger stimuls will open more channels and will produce a larger change in permeability. stimulus is graded with stimulus intensity only up to, a particular level of depolarization, called the threshold potential. If a depolarization reaches the threshold, a different type of response, called an action potential, will be triggered. The action potential is the nerve impulse. It is a nongraded all-or-none event, meaning that the magnitude of the action potential is independent of the strength of the depolarizing stimulus that produced it, provided the depolarization is sufficiently large to reach threshold. Once an action potential is triggered, the membrane potential goes through a stereotypical sequence of changes. During the depolarizing phase, the membrane polarity briefly reverses, with the interior of the cell becoming positive with respect to the outside. This is followed rapidly by a steep repolarizing phase, during which the membrane potential returns to its resting level. Fig. 2.5. There may also be a phase, called the undershoot, during which the membrane potential is more negative than the normal resting potential. The whole event is typically over within a few milliseconds. Two types of voltage-gated channels contribute to the action potential: potassium channels and sodium channels. Each potassium channel has ,a single gate that is voltage-sensitive; it is closed when resting and opens slowly in response to depolarization. (ii) an inactivation gate, that is open when resting and responds to depolarization by closing slowly. 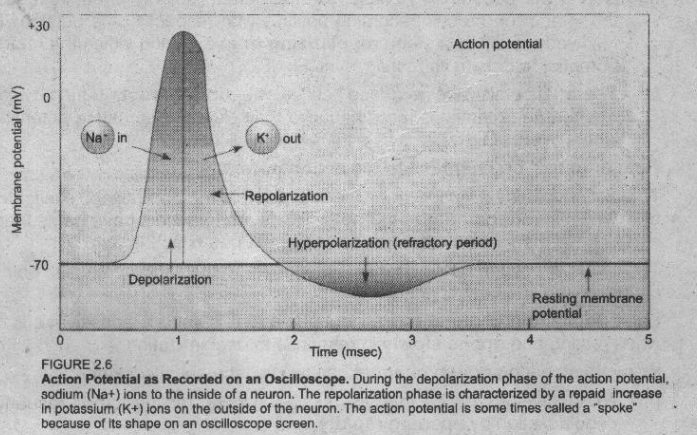 depolarization the activation gate opens quickly, causing an influx of Na, which depolarizes the membrane further, opening more voltage-gated sodium channels and causing still more depolarization. This inherently explosive process. example of positive feed back, continues until all the sodium channels at the stimulated site of the membrane are open.